I hope you all enjoyed the last post! This one is going to be quite long so I'll try not waffle on. 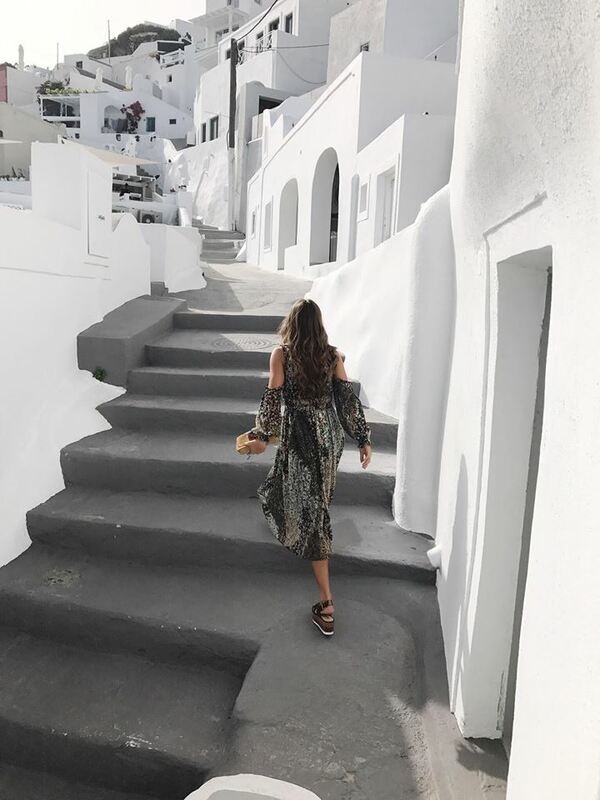 On our third day we ventured to the town of Thira (or Fira), the cutest little quaint town, with cobbled streets, rooftop bars with the stunning sunset views, and loads of little greek taverns and restaurants. This dress is definitely my favourite piece of clothing I have bought in a long time. I love mid-length dresses, I find them so flattering and the cut out shoulder detail allows the perfect amount of skin to be shown through. Dress, shoes and bag are all Zara - I can't help myself.. the obsession is definitely real. I got this dress the best part of a year ago so I have linked something similar. This bikini is from Fashion Prescription - it runs big so I would definitely say go down a size if you're going to purchase. I also have a 10% off discount code which I think is still active, put 'nadiaanya__' in at checkout. Day three we headed to Oia, the most famous part of Santorini. Although it was stunning, I don't think it lived up to the hype around it, I would definitely say Thira was my preference of the two. This outfit was a last minute purchase from Zara - how AMAZING!! This two piece can also be worn separate with some colours added, creating lots of different outfits, as well as being very light weight - the perfect buy for summer. These shoes again were a last minute buy and I adore them. I have so many flatform shoes, and I live in them throughout summer as I definitely don't have the patience for sore feet and high heels whilst being hot and consuming lots of alcohol.. The gold picks up the sunlight in such a gorgeous way, and they go with almost everything I would wear on holiday, as well as being easily worn back in England with jeans, dresses, culottes etc. I have been on the hunt for years for a turban or headband that actually suits me, and that doesn't accentuate my already round head. I'm not even ashamed at this point to say where it's from - you guessed it - Zara. They also have so many different colours and styles so I'll be getting a few more for my next holidays. 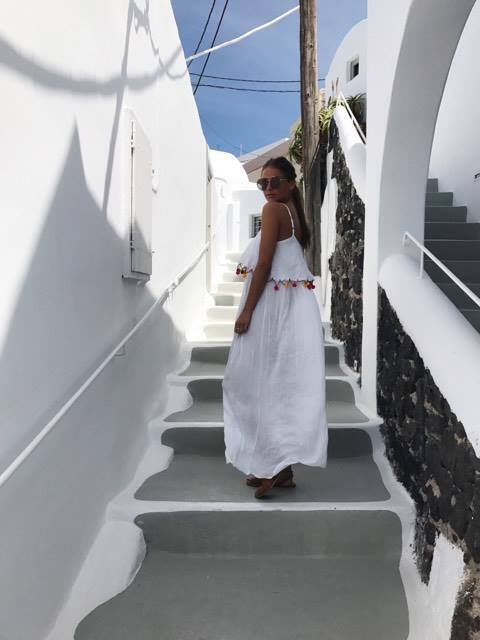 The next night we headed back out to Thira for dinner and drinks, it was a really warm evening so this dress was perfect. I love the sleeves of this otherwise simple dress, combined with the vibrant yellow, it looks so gorgeous with a tan. 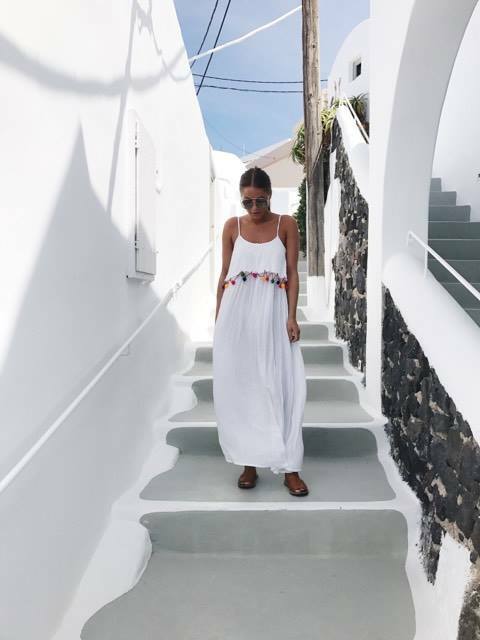 I believe that simplicity is key when it comes to fashion, and even more so when dressing for hot weather - that's not to say I don't love busy patterns such as the midi dress above, but simple tailoring, hemlines and colour schemes always look so effortless and stylish. Carrying on the cool sleeve vibe, this dress is so gorgeous!! It's from Pretty Lavish - a company I found on Instagram. They stock stunning summer items as well as loads of other lovely pieces for all seasons. The lace detailing is so sweet and feminine and white is such a perfect colour for Santorini. I bought this cute dress last summer and still adore it! I know pom-poms are a little last year but I think they add such a sweet pop of colour to this dress. The weather turned fairly bleak (for here) for our last few days, so no more pretty outfits to show, but lots of time to sort this post out early! I hope you all enjoyed this - lots more holidays coming up in the next few months, and loads more to come in general, so stay tuned! thank you for sharing this useful article .pashionclothing is the leading clothing supplier in germany and other europian (EU) nation.click here..!! !